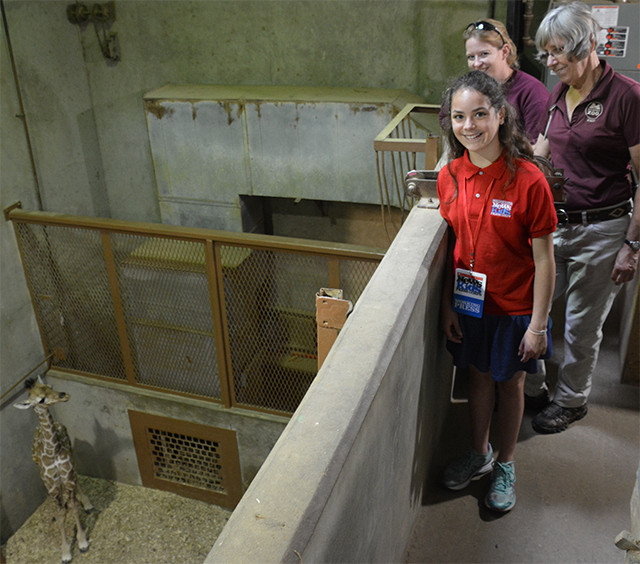 Baby Steps Toward Survival | Kid Reporters' Notebook | Scholastic Inc.
Sadie visits Bogey, a baby giraffe, at the Memphis Zoo. On March 23, the Memphis Zoo in Tennessee welcomed a baby hippo named Winnie to the world. Only 11 days later, Bogey, a baby giraffe was born. These adorable miniature versions of their parents are more than just cute animals to look at. Winnie and Bogey are playing a big part in helping their species’ populations be “healthy and vibrant,” said Matt Thompson, Director of Animal Programs at the Memphis Zoo. Hippos and giraffes are listed as “vulnerable to extinction” in the wild. Zoos in the United States are doing their part to help these animals survive—and thrive. That is why many zoos, including the Memphis Zoo, take part in the Association of Zoos and Aquariums (AZA)’s Species Survival Plan (SSP). SSPs, Thompson explained, are programs led by experts on a certain animal whose goal is to “have the population of their target species be as genetically diverse as possible” in captivity. The group recommends which animals should breed or be traded to other zoos to breed in order to keep that species’ family tree diverse. The zoos play their part in SSPs by doing their best to fulfill the recommendations. Winnie, a baby hippo, plays with her mother, Binti, at the Memphis Zoo. Winnie and Bogey’s births are especially significant because the SSP recommended breeding for both sets of their parents. The baby animals are living proof of the important role that zoos can play in protecting endangered species. Together, the Memphis Zoo and other SSP participants make up a crucial piece of the species survival puzzle.